They enjoy it. In the late sixties and seventies, more women started going to college and working outside the home, and many found careers that are fulfilling and enjoyable. In fact, not only are women increasingly staying in the workforce, they’re staying in full time positions. Almost half of women working in their late sixties are in full-time, year-round jobs, up from about 30 percent 20 years ago, according to one study1. They’re living longer. Americans today are living longer than ever, and women can expect to live longer than men. A 65-year-old man today can expect to live to 83, while the average 65-year-old woman will live to almost 86, according to the Centers for Disease Control2. The longer lifespan means women have not only more years to work but also more retirement years they’ll need to cover financially, which gives them additional incentive to stay in the workplace a little longer. They need the money. 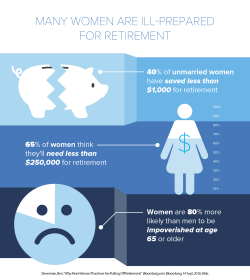 Unfortunately, many women are ill-prepared for retirement and are working longer because it’s financially necessary. Because women tend to be the central caregivers in a household, for children as well as aging parents, they often spend less time in the workforce, which can reduce their expected Social Security benefits and limit the amount of money they’re able to save in workplace retirement accounts, like 401(k)s. Women also tend to earn less than men, 79 cents to every male employee’s dollar. As a result, many women are facing risky retirement years. One study3 found that women are 80 percent more likely than men to be impoverished at age 65 or older. Additionally, women ages 75 to 79 are three times more likely to fall below the poverty level than men in the same age group. Single women are particularly vulnerable. A recent survey4 found that 40 percent of unmarried women have saved less than $1,000 for retirement. Experts say education surrounding retirement funds is key to helping women retire. Women often don’t know just how much money they’ll need for retirement: About 36 percent of unmarried women and 29 percent of married women think they'll need to accumulate less than $250,000 for retirement, according to the EBRI survey4. Meanwhile, the majority of men believe they should have saved $500,000 or more. Working longer can help, but health issues and job loss can often interfere. According to a Transamerica study5, 56 percent of women plan to retire after age 65 or not at all, yet the average retirement age6 for women is just 62. The better plan? Saving early and often, experts say. 1 "Women Working Longer: Facts and Some Explanations." NBER. N.p., Sept. 2016. Web. 2 National Center for Health Statistics. Health, United States, 2015: With Special Feature on Racial and Ethnic Health Disparities. Hyattsville, MD. 2016. 3 "National Institute on Retirement - Women 80% More Likely to Be Impoverished in Retirement." The National Institute on Retirement Security, Mar. 2016. Web. 4 "2016 Retirement Confidence Survey." 2016 Retirement Confidence Survey (n.d.): n. pag. Employee Benefit Research Institute and Greenwald & Associates. Web. 5 "Investor Retirement Survey and Outlook on Empirical Analyses about Individual Retirement-specific FPB." Contributions to Economics Individual Financial Planning for Retirement (n.d.): 137-77. Transamerica Center for Retirement Studies®, Mar. 2016. Web. 6THE AVERAGE RETIREMENT AGE – AN UPDATE (n.d.): n. pag. Boston College, Center for Retirement Research, Mar. 2015. Web.